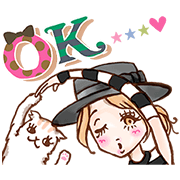 http://www.line-stickers.com/ – Kumicky’s Talking Stickers Line Sticker | Fashion model Kumiko Kumicky Funayama has a new set of sound stickers on LINE! Sass and soothe your friends all at once with Kumicky and her pet cat Roi! *The sound for these stickers will play on iPhones even if your device is set to silent mode. Previous post OH! MY HAROLD!